Bright Website Design are delighted to welcome a new member of the website design team at their offices in Stockport. Nathan has joined the team at an exciting phase, as Bright Website Design have a varied pipeline of websites currently in production. From a luxury lingerie boutique in Cambridge to a global manufacturing company, Bright Website Design are producing responsive websites that look great and perform well with successful SEO campaigns. Nathan brings a wealth of experience and enthusiasm, “I’m looking forward bringing my creativity to the table, inspiring my new colleagues and building strong customer relationships.” Nathan’s committed work ethic is equally as driven as his devotion to fund raising and charity work. Whilst volunteering in a rural village in Ghana, Nathan saw first-hand the daily struggle to simply get water and even then the water was not clean to drink. Realising the obvious health risks, Nathan also wants to help so children so they do not miss out on their education, walking long distances to collect dirty water. Nathan’s greeting cards are printed on thick sustainably sourced card with a satin finish on the outside and blank on the inside for your own message. 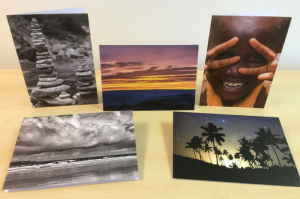 The cards are £2 each, if you would like to purchase any of the cards email nathan@neotericnetworks.com. Click here for more information about Bright Website Design responsive website design and SEO.